One of the incidental projects that I did during my stint in Iloilo was to make a makeshift sulugbahan(grill). We were in the process of constructing a multi-use commercial building. There we lots of cut (kabilya) rebars and metal sheets lying around. Before some unseen hand decided to send it to the junk shop for beer money,I thought of making a grill out of the bars. I had the rebars precut by one of the construction workers and have it sent to the welding shop and in about two days we've got a new charcoal grill. I wasn't even charged for the welding job.It looks like a typical grill you would see on the sidewalks were ambulant vendors sell chicken inasal,isaw and pork barbecue. Very third world, I should say, but it didn't look that bad with flat black paint. Before adding charcoal, we put a layer of earth and sand on the metal sheet to insulate the sheet from the heat. I had the grill sent up to the open rooftop and what fun it brought. Almost every night we would have supper on the rooftop. My nephews just loved the idea.Our menu consisted of marinated grilled pork belly, chicken inasal with atchara, kinilaw and all kinds of fresh fish.We didn't have to eat out. It brought the family together and the maids didn't mind carrying stuff to the rooftop every night. 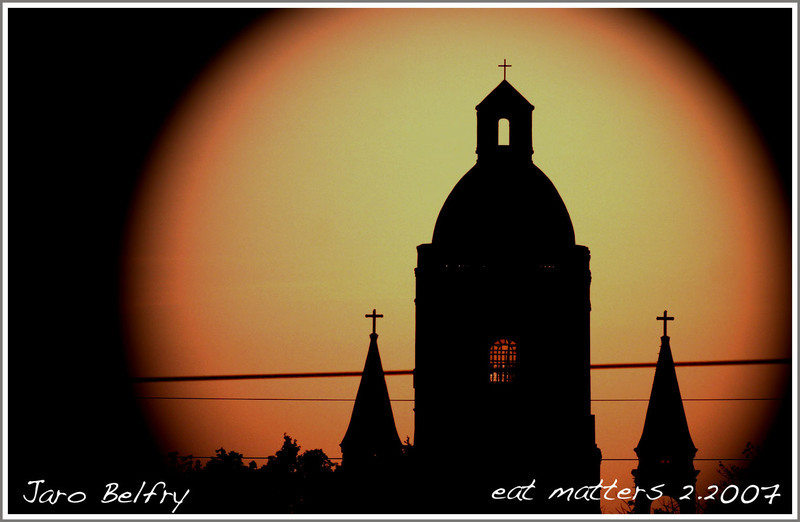 They were part of the party.The view of the Jaro belfry and the cathedral can be viewed. These rooftop dinners was one of the heartwarming highlights of my vacation. If only if only for this, I had second thoughts of going back. 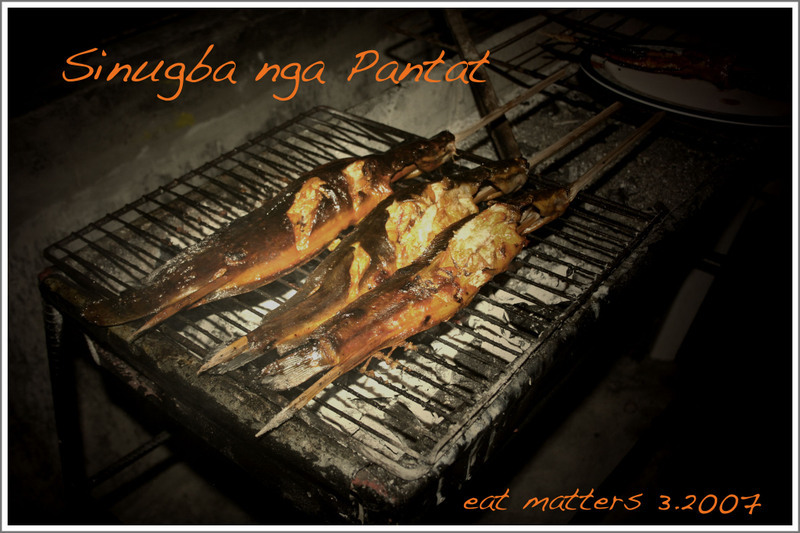 One of the fishes we grilled on the rooftop was Pantat, Hito or catfish. Some call these slippery, scaleless creatures mud fish. They can be had fresh at a nearby town a few minutes away from the city. You could bring the fishes home still alive and "kicking" in a plastic container with water and a heavy lid. The fish is killed with a poke of a knife on the head. This requires a certain skill because the fish is slippery and struggles hard. It is cleaned and rubbed with guava leaves and rock salt to remove the odor after which it set on a bamboo skewer ready for the grill. No need to marinate the fish because it is so fresh.Just rub with rock salt so you don't mask the distinctive flavors. While grilling, the pantat is brushed with achuete oil until done. 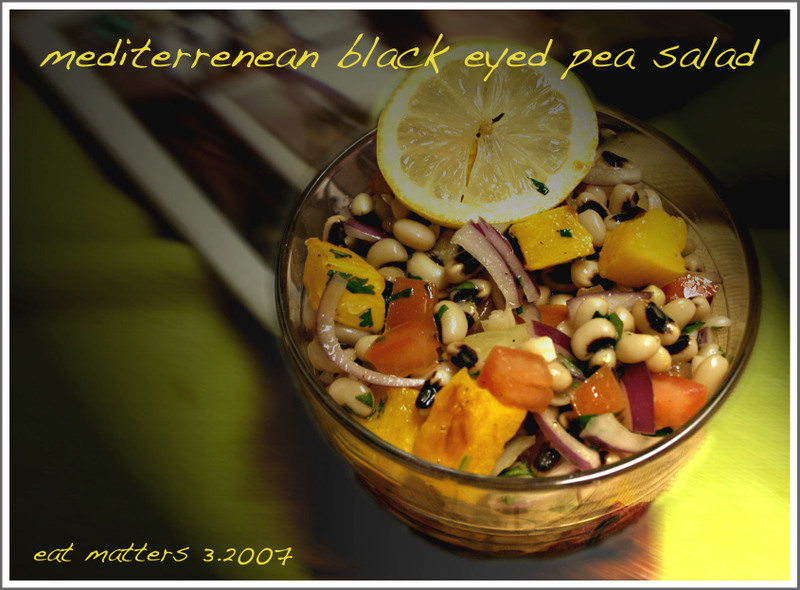 This soup is what became of the leftover black eyed pea salad that I cooked sometime ago.I made a lot of the salad and it was becoming an eye sore in the fridge. It is still too good for the garbage bin. The best recourse was to make a spicy soup out of it. The bean salad was re-sauteed with chopped yellow onions,garlic and cumin seeds. After adding some water, paprika was added as well. I peeked in to the fridge and decided to pour in some President's Choice 8 Vegetable Cocktail into the mix and let it simmer. The veggie cocktail is actually part of my ongoing healthy breakfast regimen with oatmeal and fruits.The vegetable cocktail added some body and new flavors to the soup due to an interesting (and healthy blend )of carrot, celery, beet, parsley, lettuce,watercress, spinach and concentrated grape juice. You have the whole supermarket vegetable aisle in there. After the peas have softened a bit, the soup was processed in a blender and returned it to the pan for the necessary seasoning adjustments. On the serving bowl, I garnished the soup with a teaspoon of coconut cream,chopped green onions and roasted grated coconut meat. Namit (delicious) I should say. It has hints of chili bean soup probably because of the cumin.But it has more to it when the coco cream and roasted coconut meat were added. This is what I like about making soups. You can play with a variety of ingredients. The possibilities are endless. 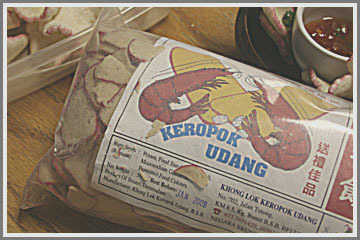 What Kropeck is to us Pinoys is Keropok Udang to our fellow brown Malay neighbors down the petroleum rich kingdom called Brunei. 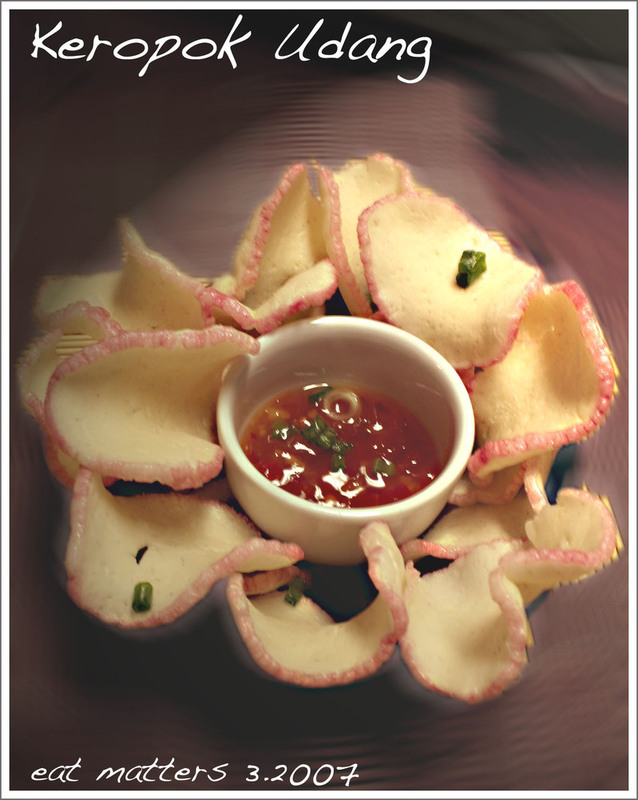 It is the same old prawn crackers with some difference in taste , shape and texture. This Udang is a bit denser,more starchy, less salty but also packs a ton of MSG like its Pinoy counterpart.It takes awhile for us who are used to eating our own Kropeck to adjust to Keropok. And saying Kro/peck aloud seems more comfortable and crispier than blurting out the three syllable tongue twister Ke/ro/pok. The last syllable reminds me of an worldly act of sinning. Udang is Malay for prawn or shrimp but sounds like the nickname of the town's noisy and nosy spinster. After frying, the shape of this Keropok reminds me of a Kalachuchi flower that blooms in the plaza during summertime.Nice. And I'm thinking of using it as a base for canapes. To give it a little zing I drizzle the the prawn crackers with garlic salt and dip it in my favorite Thai spicy sweet and sour sauce. This package of goodies from the sultanate was given to me by a drinking buddy whose dear one and only just ended her stint at the consular office in Brunei. We met up in Manila a day before I flew to the land of maple leafs. I am mentioning this because in the heavy din of things, I forgot to say Thanks. San Miguel was one of the reasons. 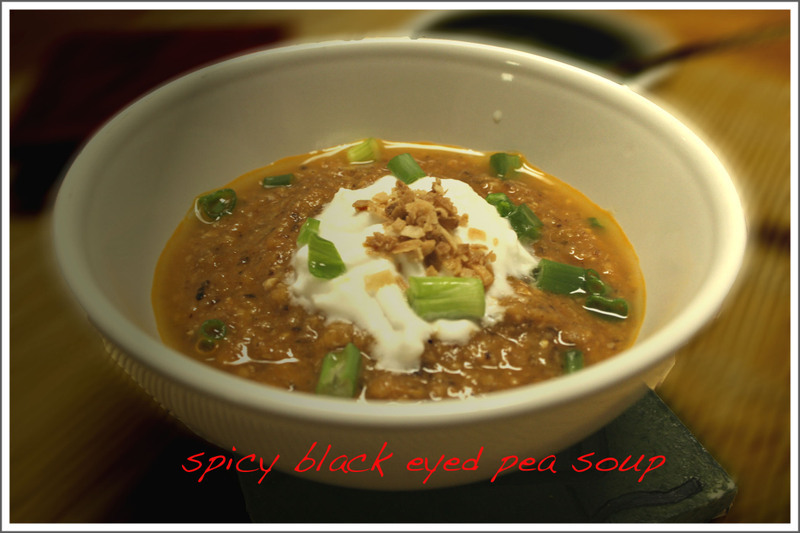 This is a recipe which I adapted from either Gourmet Mag or Bon Apetit. I don't remember which one. Since I don't follow a recipe to the T, I either added or avoided some ingredients according to my taste and mood. Temper is the correct term, I guess. 1.Mix everything up and season according to your heart's desire. 2.Trust your tongue(it's the only one you have)... and your instincts. 3.Enjoy eating your salad. You deserve it. 4. Share the dish if you think its worth sharing. 5.If you think it's a so so failure, what is the cat and your enemies for? "Be kind to your enemies." Wasn't it the scriptures who said that? "The dangerous person in the kitchen is the one who goes rigidly by weights,measurements, thermometers and scales. I would say once more that all these scientific implements are not of much use, the only exception being for making pastry and jams, where exact weights are important." At around 3 p.m sometime in February I had a delicious bowl of Pata. I finished the bowl with sweat trickling down my forehead. Pata is Filipino for hock. It loosely refers to either pork or beef legs, front or hind. In the professional culinary world ,hocks are the pork's foreshanks which is part of the a primal cut called as the shoulder picnic. The hocks meat, fat and muscle are propped up by the ulna and the radius which form the foreleg bones. In North America, Europe and non-Asian countries ,the hocks are often smoked and simmered for hours unto tender to the bones. It's liquid contributes flavor to soups and stews. In the Philippines, Pork hocks are usually boiled with spices and lemon grass until tender and then deep fried to a succulent crispiness.When eaten, it is dipped in a combination of native vinegar, soy sauce,crushed garlic,onions and lots of bird-eye chilies. A delicious but life-threatening appetizer. The Crispy Pata is a mainstay in binge drinking parties. You just can't say no to it. The number of stroke and heart failures this hell of a leg has caused have not been officially recorded. In Iloilo ,when one says "pata" without the "crispy" it means tender pork hocks simmered in a stock with garlic,onions, vetsin(MSG) and a souring agent called batwan . The soup has a thin jelly-like consistency because of the collagen breakdown from the slowly simmered bones; and an orange tint due to the added achuete seed extract for coloring.The soup is occasionally garnished with sliced green onions. It is eaten as a main dish with rice or as merienda(snack) fare with pan de leche(a kind of roundish and sweet Filipino bread). During the afternoon coffee breaks, an invite from a peer of : "Ma mata ta"(let's eat Pata) is not uncommon. One usually sips the soup first and asks for a refill of caldo(stock). 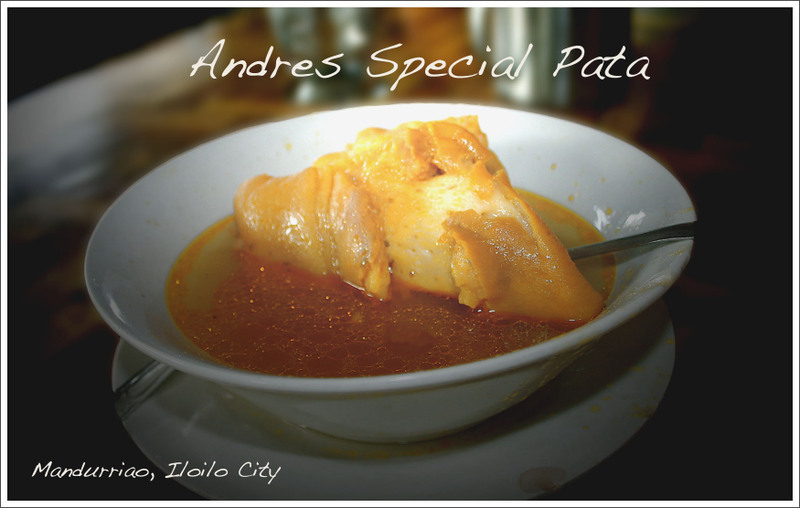 Arguably, the best place to eat Pata in Iloilo is at Andres Pata. The patahan which has somehow become an institution in the Pata business is a typical low-end shack made of nipa and bamboo. It cradled beside the road and the river. This used to be a good location for business because a few meters away was the city abattoir or slaughter house. We call it ilihawan. Ihaw means to slaughter. To our Tagalog brothers, ihaw means to grill in charcoal. Sugba is grilling to us. With this set-up the eatery has the advantage of getting the best pata in the yard. 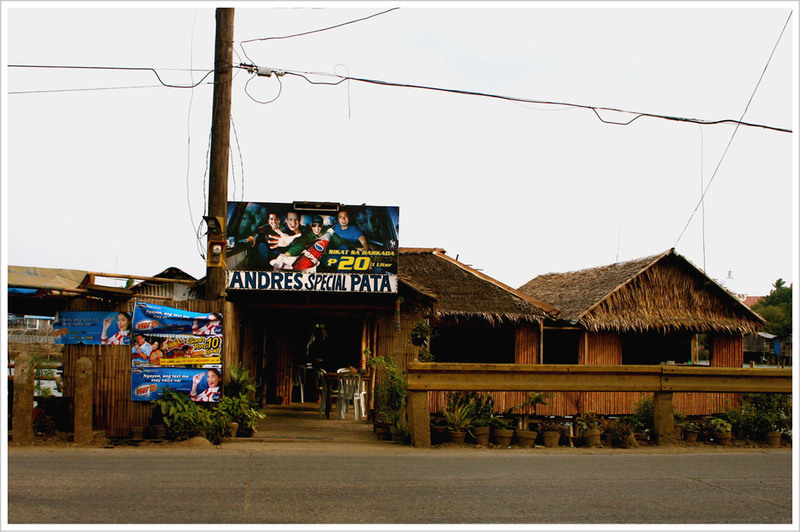 The abattoir is set to transfer its location soon but I don't think that would affect Andres' business. The weekend hiatus caught us sinning on pork and munggo (mungbean). The pork shoulder with its tender fatty tissues cooked in the bean soup just couldn't stop to beguile us with its treasure of cholesterol. Add to that a side dish --a mainstay of spicy bago-ong or guinamos( fermented fish paste) that threatens to push the blood pressure skyward. I am not ready for heaven yet. The world in all its ghastly beauty, I still want to discover, yet, while I can. For Monday dinner, I have to make amends to the weekend travesty. Pasta was the ingredient of choice as it was easy to prepare. 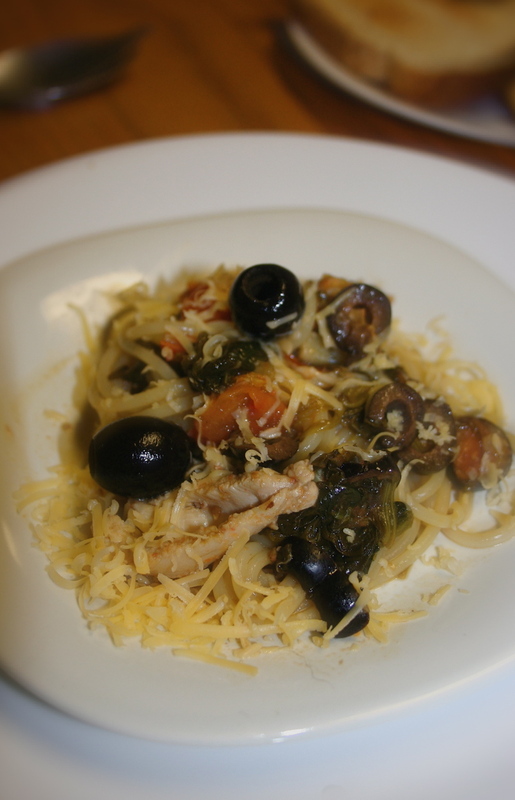 To go with it were an assemblage of of chicken,sweet cherry tomatoes,spinach and olives. A cup of shredded queso de bola was the contrasting flavor of sorts. Easy does it with this dish. Boil water in the corner of the stove and salt it until it tastes like the sea.On another burner heat olive oil on a skillet Slice the garlic and onions and the rest of the veggies.When hot enough put in the chicken until they become golden. Take the sliced parts of the bird out of the skillet and throw in the aromatics.Throw the vegetables next and add your braising liquid. The braising liquid can be water, veggie or chicken stock or wine. Your choice. Return the chicken parts to braise. When chicken parts are done take it out again and slice. Return to the skillet to continue cooking. When the pot of water boils, throw the pasta in and cook to al dente. When done. drain the pasta water and transfer the pasta to the skillet with the chicken and veggies. Plate, sprinkle with shredded queso enjoy.Better with any red wine of your choice. Beer works fine too. One fine morning at the onset of sunrise, I drove to the Iloilo Central Market to see if there is something interesting for breakfast at the fresh fish section. In one of the stalls, I came across a small pile of small fish nestled on a banana leaf. They were a bunch of lupuy (larvae of sardines) that the fishmonger offered for a song. First thing that came to my mind was pinamalhan. For our non-Filipino friends, Pinamalhan is a way of cooking fish in a shallow pan or earthenware with vinegar and spices till the acid dries up. Mala means dry. It is also a traditional cooking technique developed way back when refrigeration was unheard of. The vinegar preserves the fish sans the aid of General Electric or Frigidaire. 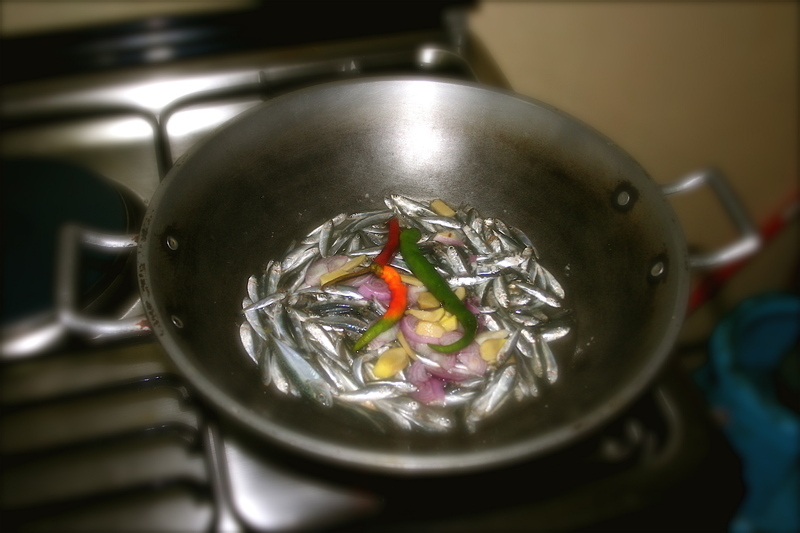 The other method of cooking is to charcoal broil these small herrings with the condiments wrapped in banana leaves. . This method creates another layer of flavor to the fish.Equally delicious like the Pinamalhan. Because I was so excited to have the fish on the breakfast table on time, I didn't bother my all-around sidekick, who was still snoring anyway because of Tanduay rum overdose, to go and cut some banana leaves. Segue to Canada. . . . I was running a little research on the lupuy on the net and this is what I stumbled upon. According to a Philippine Bureau of Fisheries and Aquatic Resources(BFAR) memo dated 1939 signed by a certain Benigno Aquino, the incumbent Secretary of Agriculture and Commerce during that era( i wasn't even a speck of creation then), "It shall be unlawful for any person, association,or corporation to kill or catch, or cause to be killed or caught or taken from these waters, purchase, sell, offer or expose for sale, any sexually mature sardines,or herrings, or their larvae of young known as siliniasi or lupoy during the closed season from November 15 to March 15, inclusive of every year, in that portion of the Visayan Sea, north of the island of Negros and between the northern parts of the island of Panay and Cebu." Hahaha.So I broke the law by purchasing those delicious lupuys and ate them with steaming rice like there was no tomorrow. And that was last January during the prohibited season.Gee. I didn't know buying those is illegal as smoking pot. Really,why are the authorities beginning to deprive us as the most enjoyable things( i don't mean the pot) in life by making them illegal.Look at what the Chicago authorities did to the foie gras. Ok. let the BFAR authorities catch me if they can. But before tightening the noose on an inconsequential small fry like myself, let them catch the Big Fishes first-- those big time businessmen earning millions engaged in illegal fishing right under their noses. Right now I am thinking of cooking lupuy wrapped in marijuana leaves.I think it's gonna be heavenly. Hey, don't call the cops. I'm just kidding. Had this deep fried cephalopod with my beer last Saturday while everyone else was going green celebrating St. Patrick's Day. I wasn't in the mood to drown myself in pints of dark Guinness or Irish whiskey in the local Irish pub nor lather my face with green paint. and party like crazy. Calamari is a bestseller appetizer and is easy to make. Just cut the squid cross wise into rings, season it with salt and pepper and marinate in your favorite citrus juice. After a while, dredge the squid into seasoned flour, dust and deep fry it in oil with the correct temperature. 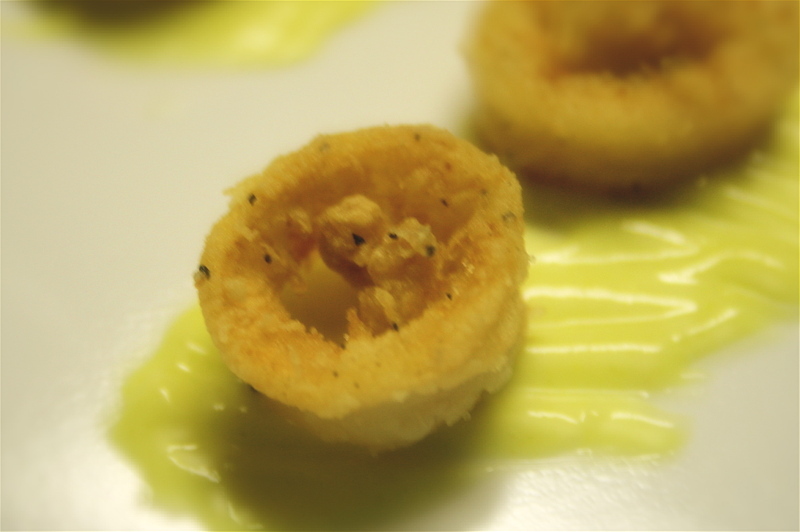 The secret to a good Calamari is to deep fry it in the correct oil temperature. Doing this, you will get the perfect crispiness and attractive golden brown color. The oil should be heated up to between 160C and 190C. The deep fried will end up soggy if the oil is not hot enough. This is where a cooking thermometer comes in handy. An avid cook should have one. For the sauce, thoroughly mix some wasabi paste, garlic powder with mayonnaise in a bowl with a drizzle of lemon oil.You can use a small whisk if you want but a spoon will do the trick as well. Since wasabi has a very strong taste, add it gradually until you get the desired taste. 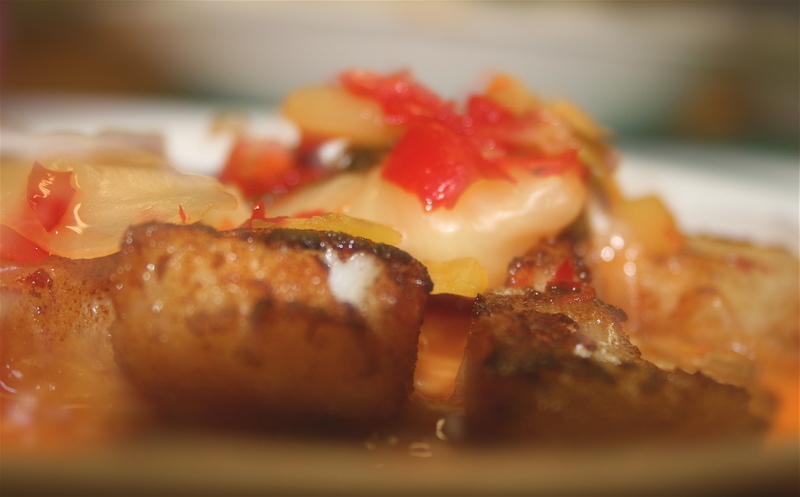 In the hands of an able cook, fish can become and exhaustible, source of perpetual delight. 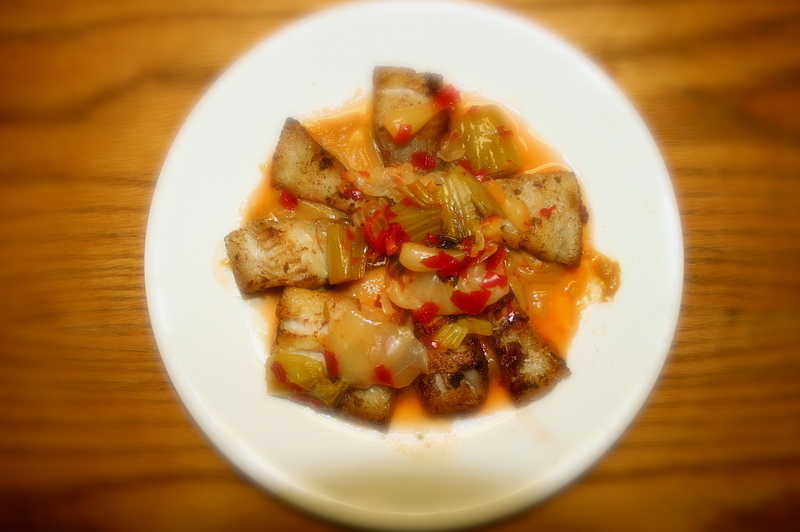 I cooked this dish sometime last week after a visit to my favorite Oriental grocer. I took a fancy on the Miso paste on the Japanese aisle and got curious with a bottle labeled Kim Chi on the Vietnamese section. It was not the Korean Kimchi made of pickled cabbage but a spicy sweet and sour combo of pickled vegetables. The bottle was packed with thin sliced carrot rounds,white baby Bok choy stems, small green onion bulbs and chilies. The taste was not as hot and salty like the authentic Kimchi but tastes similar to the sweet and sour atchara(pickled shredded green papaya),but spicier . I actually got a second bottle because the first was gone in a matter of three days. A perfect constant accompaniment to steaming rice. To make the dish, I cut the Pollock into portions and marinated the pieces with key lime juice,nam pla and some crushed black pepper. Then I made a Miso sauce by adding Chinese wine and minced ginger to the Miso paste and mixed them well. I added a little sugar to balance the taste of the sauce. This I made as a base sauce for the fried fish. I added about two teaspoons of the vegetable pickles and a little drizzle of it's liquid on top the fish, to compliment the slightly salty Miso sauce. I think this would make a good spicy Lenten treat. Most dishes that I create are a result of instinctive, spur -of-the-moment experiments with texture and flavours. I never really follow a recipe. Nor I enjoy writing one.No rules either.It's the rebel in me I guess. I enjoy cooking this way--to come up to the challenge of playing with ingredients.Yes, there is always the fear that I'm churning out hog's feed and worse. And it does happen when the dish lands in a receptacle underneath the sink. But the joy of creating surpasses all that. 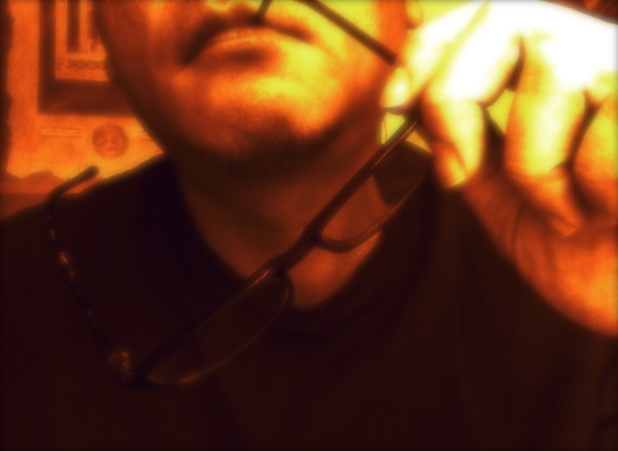 Once an idea is applied into a main ingredient, everything flows logically.For a moment you loose yourself to chaos. You release the inner chef. The inventor Henry Ford said: One of the greatest discoveries a man makes, one of his greatest surprises, is to find he can do what he was afraid he couldn't. I know that these creations couldn't hold a candle against the fabulous dishes of the gifted chefs--or maybe it can-- but that is not the point.By overcoming a fear and ending up surprising myself is. A Eureka in my small kitchen. I like to call these discoveries my "delicious little morsels of self-satisfaction". It makes me happy even if the rest of civilization is not.